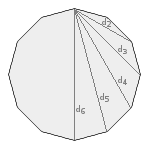 Calculations at a regular dodecagon, a polygon with 12 vertices. Enter one value and choose the number of decimal places. Then click Calculate.